Come discover Whistler & Shannon Falls on a full day trip up the Sea to Sky corridor! Experience the power of one of British Columbia’s tallest waterfalls and prepare to be mesmerized by the area’s gigantic trees and old-growth stumps. This tour also features a stop at the Squamish and Lil’wat Cultural Center, which shares the culture of local First Nations. Take in views of the surrounding snowcapped mountain peaks and Howe Sound’s coastal fjords. Spend four hours at your leisure exploring Whistler Village. If you are feeling adventurous, view the mountains around Whistler from a different angle by booking the one of the tour add-ons, such as the PEAK 2 PEAK Gondola. Grab your camera and get ready for a scenic trip along the Sea to Sky corridor. Your driver will pick you up from your hotel and guide you through Vancouver. Travel over the historic Lions Gate Bridge and view the picturesque downtown skyline of the city. 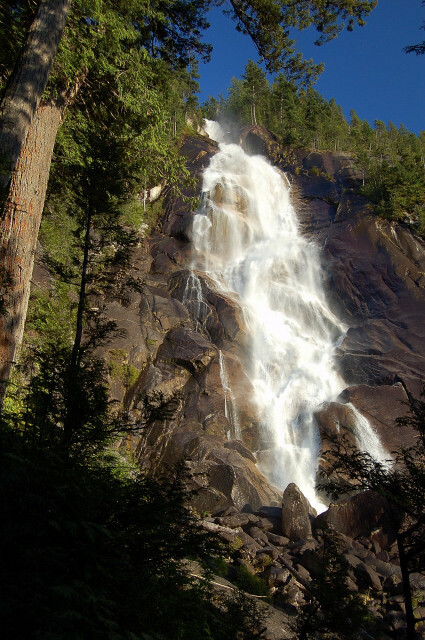 Head north and stop at viewpoints along the Sea to Sky highway, such as Shannon Falls. Pass by towering mountains, ancient glacial fjords and the famed ‘Stawamus Chief’ (the second largest granite monolith in the world). Take your time exploring Whistler Village. With the impressive mountains and sprawling forests, this charming village offers everything from relaxing spas and scenic strolls to adrenaline pumping activities and breathtaking views. We suggest purchasing a Peak2Peak Gondola ticket, to experience the longest and highest lift in the world! Visit the Squamish Lil’wat Cultural Centre and enjoy a one hour guided tour through this First Nations cultural museum. Your 10.5 hour excursion concludes back at your departure point. Book your Whistler & Shannon Falls Day Trip with Alpine North Limousines Today!